Description: Now! 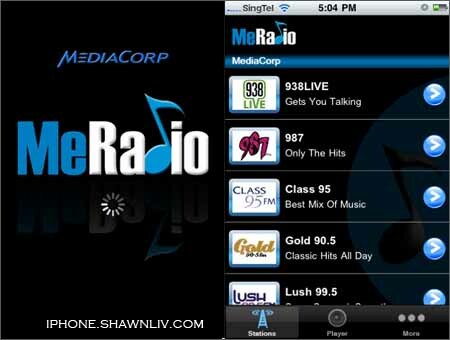 ALL 13 MediaCorp Radio Stations in ALL four languages on your iPhone or iPod touch. MeRadio from MediaCorp delivers the culturally diverse and cosmopolitan sound of Singapore wherever YOU are. Now you can easily hear your Singapore favorite stations and get the best audio entertainment and up-to-the-minute news and information on the go. Hi, I have Queriabout the application of the radio. Few days ago, I have succesfully downloaded the mediacorp radio into my ipod touch and it is said that we can still listenthe radio even we close the application by clicking the background tab. First I was able to listen to it at background but after I update the OS from 3.0 to 4.0 the background tab suddenly change to MEDIACORP and from there I am not able to listen it at background. What should I do to listen like the first time I downloaded it? 2. Perform a reset. Hold down the home and power buttons together for 15 seconds and let go when you see the apple logo. 3. Download MeRadio from the App Store again. is it possible to use this app without wifi?